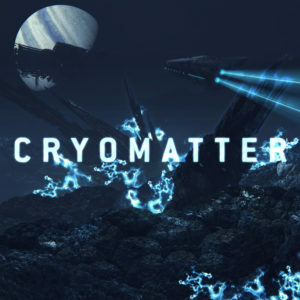 Veteran sci-fi music producers Cybernetika (Lars Goossens) and Xenofish (Christian Becker), both from Germany, hereby introduce their collaborative project, Cryomatter, with a self-titled debut album from Ektoplazm. Featuring a multi-dimensional exploration of many different musical genres, the album tells the story of an alien form of matter threatening the integrity of our universe itself..
“On the far side of the galaxy, inside a frozen nebula, a new form of raw crystalline matter revealed itself to the human eye. This cryomatter, as we named it, entered our dimension through a quantum rift. It was discovered that this strange substance was designed to eliminate all movement and progress, to put the universe into stasis and to collapse time itself. Before the stasis began a small team of scientists managed to escape through the rift where they discovered a world beyond their comprehension. Isolated from the effects of the cryomatter, they discovered its source and the powers that control it. In their desperate search for a way to reverse the effect, they managed to find a way to banish the cryomatter and end the stasis. All tracks written and produced by Cybernetika (Lars Goossens) and Xenofish (Christian Becker). Track 3 and 4 written and produced by Cybernetika. Track 7 and 8 written and produced by Xenofish. Mastering and artwork by Xenofish. MP3 Download | FLAC Download | WAV Download · Download count: 16,686. And I listen to psy for 13 years. Just amazing talent, thank you for everything! 06 – Cryomatter – Reassembly (182 BPM) BÄÄÄÄÄÄÄÄÄÄÄÄÄÄÄÄÄÄÄÄÄÄÄMMMM!!!!!!!!!!!!!!! five stars without even listening! and, of course, a trip to the next dimension, Big! greetings!!! Lars and Christian, how are You? This album goes way past excellent. Holy moly! I am in love with this one. And of course more of these tasty breaks! Can’t contain my excitement listening to this and see Spruce’s release right below. Ektoplazm is the place for the best, most innovative releases, amazingly all free and legal. Thank you Basilisk for these 4 years of great music (hope i’ve found about it earlier). Sorry for spam. Big thank you to all the artists involved! Actually after 4':16" I wasn't on earth, I can't true explain about that! Words cannot to fair explain about this neo experience! Really really good. You can even feel some of that early-2000s vibe from the first Cybernetika works.